Reading expert Brenda M. Weaver has developed an assessment system that enables teachers to screen students and monitor their progress in reading and writing all year long. Perfect for fulfilling the requirements of RTI (Response to Intervention), the ready-to-go assessments help teachers identify students who are making adequate progress, those who need extra support, and those who need intense intervention. Each assessment is linked to research-based intervention strategies so teachers have at their fingertips the tools they need to provide targeted support. 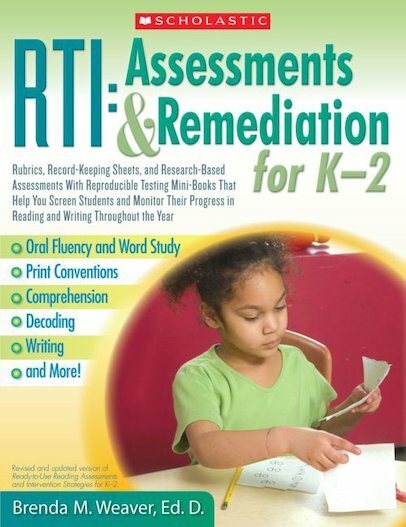 This updated and revised version of Ready-to-Use Reading Assessments and Intervention Strategies for K-2 includes record-keeping forms and ten reproducible assessment mini-books. For use with Grades K–2.